There was once a time when the question “What type of screwdriver do you need?” only had two answers: flat head and Phillips. Today, the options are endless. Do you want manual or electric? What type of battery do you prefer? There are even a variety of screw head shapes to consider. For example, many modern appliances contain screws with a star-shaped head. If you’re going to use your screwdriver with a variety of heads, the easiest and best solution is to purchase a cordless electric model with changeable bits. The tough part is deciding which one. Here are the facts on four of the highest-rated models to help you make your choice. The Dewalt DW920K-2 measures 11 inches high and 2 inches wide with a depth of 14.81 inches. It can be used with wood, plastic, and light-gauge metal. It’s a professional grade cordless screwdriver that is also great for everyday projects around the home. This cordless screwdriver manages to stay lightweight, which might come as a surprise considering it runs on a 7.2 volt nickel cadmium battery. In the world of batteries, the NiCad is what might be referred to as “old school.” For decades, anything cordless ran on NiCad batteries but, in recent years, the lithium ion battery has provided a more lightweight option. One of the few complaints about this screwdriver is that the battery doesn’t last as long as a lithium ion, which is to be expected. It comes with two batteries, however, so you’ll always have a spare and they take only sixty minutes to charge on the included charger. It’s also worth noting that the lithium ion battery is a slightly more expensive option, which makes this relatively light-weight cordless screwdriver with the lower cost NiCad battery a great find. The DW920K-2 packs a lot of power for its size. It provides 80 inch-pounds of torque which makes for a high weight-to-power ratio. In layman’s terms, the weight-to-power ratio is the power generated by a power tool (or car or athlete) in relation to its size. In most cases, you’ll be looking for a tool that provides maximum power at a minimum weight. The screwdriver offers variable speeds up to 500 rpm and a reverse trigger switch, so if you make a mistake, don’t worry! You can remove the screw as quickly as you put it in. 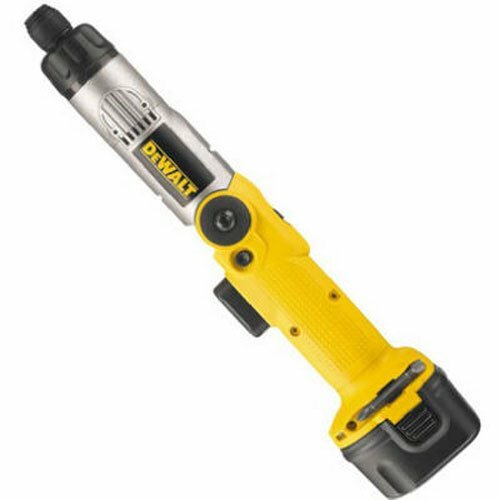 This Dewalt has a two-position handle which means it can be used as either an in-line or as a pistol grip. This feature makes it ideal for getting into tight spaces. There’s also a quick-release hex shank chuck for easy bit changes. The chuck is the clamp that holds the bit in place. On many older model power tools, it had to be tightened and loosened with a key, which could become rusted or stripped over time, making it difficult to turn. The two-position handle combined with the surprisingly light weight and quick-release chuck makes this an excellent choice for those who may have mobility issues in their hands and wrists, such as arthritis, because it reduces strain on the joints. One of the reasons this screwdriver is so versatile is that the adjustable chuck locks in sixteen different positions. On the lowest setting, you can do jobs that require less pressure and more precision, such as changing a light switch plate. The higher settings can be used for jobs such as putting up shelves or even hanging drywall. It can be used as a drill, however, it isn’t recommended for use with concrete, harder varieties of wood, or heavy metals. Another feature of the Dewalt is that it has an electric brake, which means the chuck will stop spinning as soon as you release the trigger control. This is preferable to the older model cordless screwdrivers, on which the chuck would take several seconds to stop spinning after you released the trigger. The benefit of the electric brake is two-fold: It conserves battery power and also reduces the risk of injury from a spinning bit. When you purchase the Dewalt DW920K-2, the box will contain the drill along with two rechargeable NiCad batteries, as well as the charger, two bits and the kit box. You can purchase additional bits at a fairly reasonable price. DeWalt offers a 65-piece set containing bits for the most common types of screw heads which generally retails for under $15. It also doesn’t contain drill bits, so you would need to purchase those separately as well. The charger is a sturdy cradle which keeps the driver secure while it’s charging. There is very little to say about this drill that isn’t positive. The primary user complaint is that the bit doesn’t fit as snugly into the chuck as people would prefer and therefore wobbles a bit. Some users also had issue with the position of the forward/reverse switch, finding the location more suitable for a left-handed person than a right-handed one. The DW920K-2 usually retails for between $70 and $80. It comes with a 90-day money back guarantee and a 3-year limited warranty. The Black & Decker PD600 shares several features with the DeWalt DW920-K. The PD600 runs on a 6-volt nickel cadmium battery. Like the DeWalt, however, it is surprisingly light, weighing just 1.5 pounds. It measures 12.6 inches long by 2.3 inches wide and has a depth of 11.2 inches. It has an ergonomically shaped body which makes it easy to grip. The adjustable handle locks in three different positions which means that, like the DeWalt, it’s great for getting into tight spaces. Unlike bulkier, industrial-type cordless screwdrivers, this one is small enough to keep in a drawer so it’s handy for everyday use. The Black & Decker PD600 has an adjustable torque, so you can be sure to get just the right amount of pressure for the job at hand. The lower speed, used for driving, provides 80 inch-pounds of torque, while the higher speed, best for drilling, provides 40 inch-pounds of torque. The quick release chuck doesn’t require a key. It locks into twenty-three positions to accommodate different sized bits and prevent the stripping of screws. It also has a reverse trigger switch and variable speeds up to 600 rpm. The PD600 is not quite as powerful as the DeWalt but it’s a great little screwdriver for basic, around the house projects such as furniture assembly and hanging mini-blinds or decorative shelving. If you have kids, it’s also great for a assembling larger toys such as play houses and kitchens or removing those maddeningly tiny screws that hold the battery compartment closed. Many users have also rated it as an excellent tool for electrical work. It can also be used as a drill for jobs such as drilling starter holes. The PD600 has the added feature of an integrated LED light, which comes in handy when working in dark spaces. Some also come with a five-foot integrated tape measure, however, this is not standard, so if it’s a feature you want, please be sure to check before purchasing. The biggest user complaints regarding the PD600 are related to the batteries. The battery is designed to last 3-6 hours without charging but some users have reported battery drain in as little as two hours. Also, it does take six hours for the battery to charge once it’s been depleted. If you’re planning to undertake several projects in a short span of time and are concerned about battery life, you may wish to purchase an extra NiCad battery, which is very inexpensive. 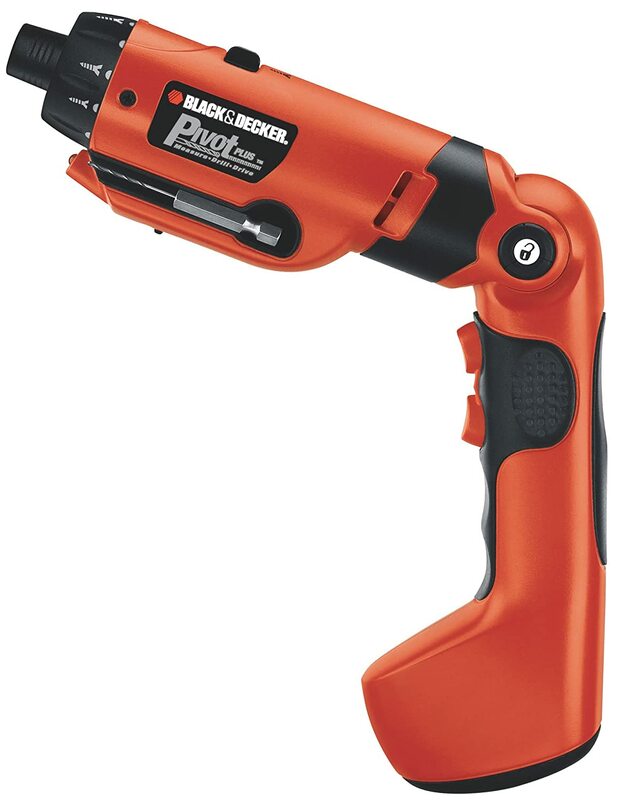 The Black & Decker PD600 retails for between $25 and $35 and comes with a limited two-year warranty. It includes the screwdriver, battery and charger. No back-up battery is included. The Kawasaki 840889 runs on a 4-volt lithium ion battery, making it the first cordless screwdriver on our list to use this option as opposed to the nickel cadmium battery. The lithium ion battery lasts much longer than the NiCad battery, allowing you to work longer without recharging. Another advantage of the lithium ion battery is that, unlike the NiCad battery, it doesn’t need to be completely drained of power before you recharge it. The Kawasaki 4-volt measures 10.2 inches in length by 2.6 inches wide and has a depth of 8 inches. It is extremely light, weighing only 1.6 pounds. It has a dual angle handle for use as either an inline or pistol-grip. Like the other products listed here, the Kawasaki features a keyless, quick-release chuck. There is no bit holder included with the Kawasaki and it’s also worth noting that it only holds one-sided bits. It comes with two, a Phillips and a flat head, but when purchasing additional bits, be sure to confirm they aren’t double-sided or they won’t fit in the chuck. The Kawasaki has an automatic spindle lock, which means the chuck and the bit lock automatically when the speed trigger is released. This is in contrast to other models which require you to manually lock the spindle. Using the spindle lock has a few benefits. It allows you to use the tool as a manual screwdriver, making it easier to control the amount of pressure applied to the screw and the speed at which you loosen it. You can also switch to spindle lock for the final tightening of the screw, to avoid accidentally driving it too far in. It also makes inserting and removing the bits safer by preventing the chuck from rotating and causing injury. 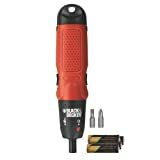 This screwdriver has an LED light for increased visibility in low light, as well as an LED low battery indicator light. While the Kawasaki does feature variable speeds, it’s not quite as fast as some other cordless screwdrivers. It tops out at 200 rpm. The torque on this model has a maximum of 27 inch-pounds. It’s not suitable for heavy duty or professional work. It’s best used on household chores, particularly those that involve working with small screws. It’s great for fixing children’s toys, video game controllers or small appliances. Users have a minor complaint regarding the positioning of the direction change switch. Some have stated that it’s very easy to hit accidentally, unintentionally changing the direction in which the bit is rotating. Like the Black & Decker PD600, a new Kawasaki 4-volt generally retails between $25 and $35. It comes with a limited 2-year warranty from the manufacturer. No back-up battery is included. The Black & Decker AS6NG won’t help you frame a house but when it comes to everyday household chores, it just might replace your old manual screwdriver forever. It’s great for installing blinds or curtain rods, hanging pictures, changing light switches . . . anything for which you would normally use a manual screwdriver. In fact, this screwdriver actually gives you the ability to switch from electric to manual driving for more control. That’s a great feature to have when you’re installing something like a light switch plate, for example, in which the plastic is fairly thin and delicate and, if you apply too much pressure at the end, you run the risk of cracking the plate. In fact, this screwdriver is great for smaller jobs that require more precision than power, such as installing handles or knobs on drawers. When operating in electric mode, the screwdriver will run in both forward and reverse. There are two bits included, one flat and one Phillips. In a slight departure for cordless screwdrivers, the AS6NG doesn’t run on a rechargeable battery. It’s actually a 6-volt alkaline screwdriver which runs on 4 standard AA batteries. The battery life will vary, depending on how often you use the driver, as well as which tasks you perform with it. Some users have stated that, with occasional use, one set of batteries has lasted as long as a year. With nearly everything running on rechargeable batteries these days, it’s nice to have a basic tool into which you can drop a few alkaline batteries for simple jobs. Although, if you prefer not to purchase alkaline batteries, this screwdriver is compatible with AA rechargeable batteries as well. The AS6NG measures 1.87 inches long by .25 inches wide by 8.5 inches deep and weighs just 10.4 ounces. It provides 20 inch-pounds of torque and a speed of 130 rpm. Please note that the speed on this model isn’t variable but if you need a bit more (or less) you can switch to manual mode where you’ll have more control. The main user complaint about this screwdriver is that there is no bit holder included. Many users found, to their frustration, that the bits tend to get lost easily. Others managed to find creative ways to store the bits and didn’t find this feature (or lack of) to be a huge issue. As for the driver itself, it has an integrated peg hole so it can be easily hung up. 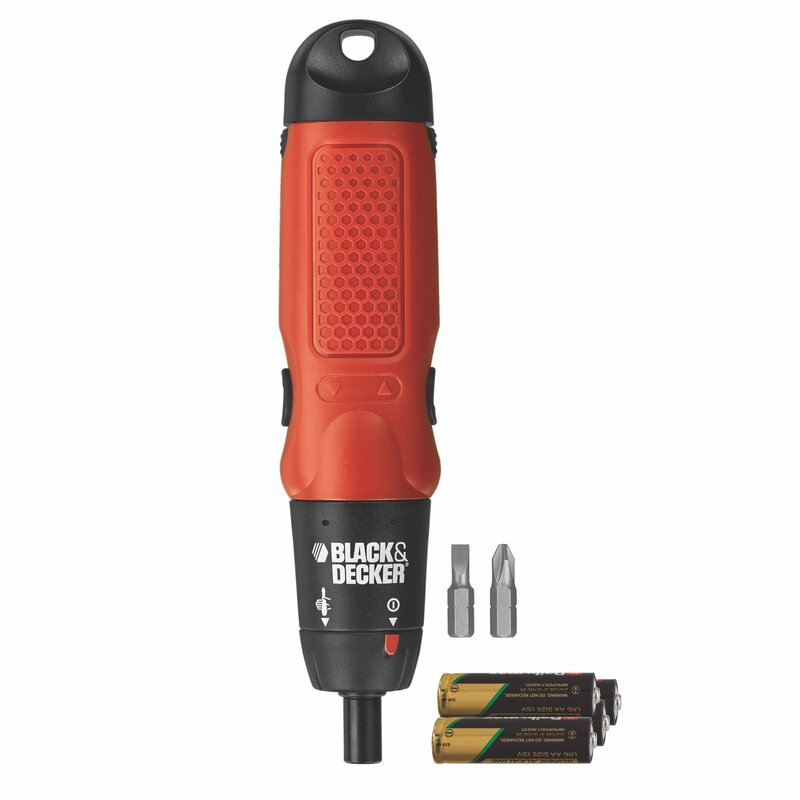 The Black & Decker AS6NG retails for under $15. There is no warranty included with this item. AA batteries are not included in purchase price. Before purchasing a cordless screwdriver, the first thing you want to consider is exactly what you’d like to accomplish with it. If you’re planning to undertake a renovation project in your home, you’ll want a screwdriver with a higher torque, as well as a higher maximum speed. For everyday household projects, such as hanging pictures or blinds, assembling furniture or fixing small appliances, a mid-range screwdriver should work just fine. If you’re just looking to replace your manual screwdriver with something a bit easier on the hands, there are some very basic electric screwdrivers which will likely suit your needs. As an example, it wouldn’t be necessary to purchase an industrial powered drill in order to hang shelves and, if you do so, you might find you actually have too much power to effectively complete those simple tasks. Using too much pressure can cause damage to the material with which you’re working, so be realistic about how much power you require. For many people, price will be the most important consideration in just about any purchase. Cordless screwdrivers are no exception. After you decide the types of projects for which you’ll be using your screwdriver, you’ll want to consider exactly how much you’re willing to spend. You should, of course, take into consideration how much you can afford to spend, but you might wish to ask yourself some other questions as well. For example, will you be making a lot of home improvements over the next few years? If so, you might decide to spend a bit more money on your purchase, viewing it as more of a long-term investment. No matter what your needs, this is one purchase where there’s definitely no need to break the bank. Regardless of your price point, there are so many options available. Decide what you’re comfortable spending and then search within that parameter for the features you need. Just like when you chose your home, you may not get everything on your wish list but you can certainly come close. While most cordless screwdrivers run on rechargeable batteries of either the nickel cadmium or lithium ion varieties, although you will find some which run on good old-fashioned alkaline batteries as well. Deciding which to purchase is really a matter of personal preference. Lithium ion batteries tend to last longer. They also don’t need to be fully drained of power before being recharged. The screwdrivers containing these batteries do tend to be a bit lighter but they also tend to be a bit more expensive. You might find you don’t get as much power for your dollar as you do with the NiCad battery. Screwdrivers running on the NiCad battery normally have a bit more weight to them, although there are some surprisingly light models available. NiCad batteries need to be completely drained of power before being recharged, so you might want to consider the cost of purchasing a second battery when making your choice. Durability is a funny sort of feature because it relies on many different factors. Any electric power tool features a symphony of moving parts and if even one is out of tune, the whole tool may cease to operate. That being said, you can definitely get an idea of the durability of a cordless screwdriver by reading customer reviews and consumer websites. These sites will also let you know if there’s a recurring issue with the cordless screwdriver you’re considering. Customers who have purchased the item will leave reviews detailing their experiences. Negative reviews are to be expected, since everyone’s tastes are different. If you see the same complaints repeatedly, however, it might indicate a defect with that particular model and you might want to reconsider buying it. It’s worth noting that just because something is more expensive, it’s not necessarily of higher quality. There are many moderately priced screwdrivers which are just as durable as their more expensive counterparts. There are many features to consider when purchasing a cordless screwdriver. 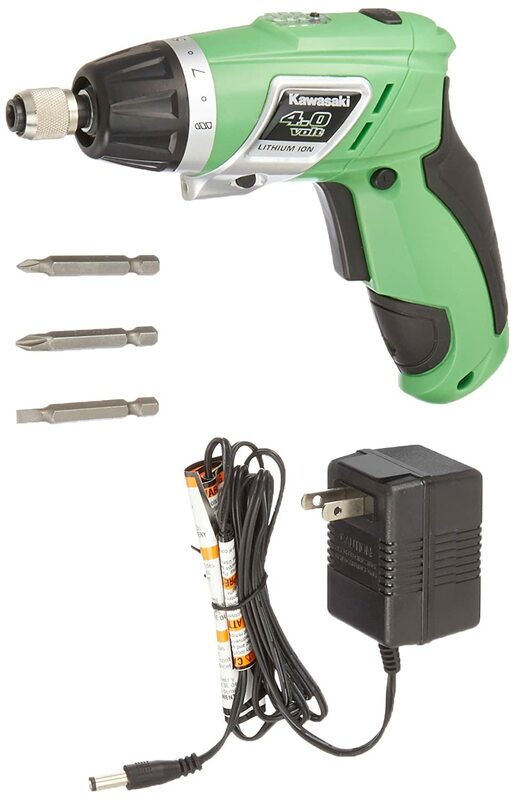 There is also a plethora of cordless screwdrivers available on for purchase. The aim of this list is to provide you with an overview of some of the best products available on the market today, however, as with any purchase, cordless screwdrivers are not one size fits all. Be sure to consider features such as power, battery type and cost before buying. Also, be sure to do your research to be sure the model you’re considering has no known issues.